Hello Sweeties 💕 I'm back with another skincare tips and sharing blog post! You can bookmark this or print screen all of these tips on your phone if you want to. 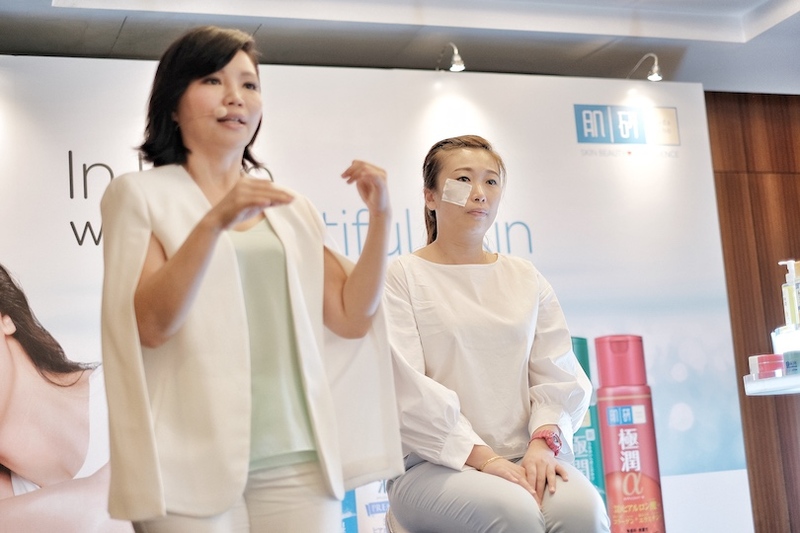 I actually wrote down everything during the hand-on beauty workshop with the famous Liu Yan beauty guru from Taiwan. 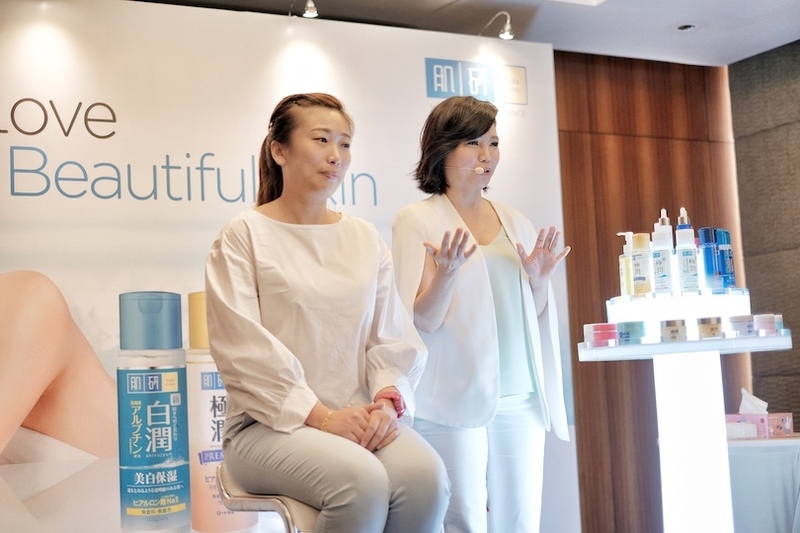 She's really really famous in Taiwan and I actually met her during the 2014 Hada Labo x Liu Yan sharing workshop too. It was my very first time and now I'm meeting with her again! Never expect the whole workshop could be so interesting because it's full of beauty tips and sharing from her. We can basically ask anything about skincare and I really love her sharing. From how to apply, the method to apply, the correct way and best way to get rid of sticky sunblock method. Or how to SOS save your skin before any important day too. So I guess you have been waiting for this post since few days ago. I'm so glad I'm one of the invited blogger and I really love to hear any beauty tips from her. So here's all the beauty tips and let's follow me to the workshop! So before the event started, we just basically removed all of our makeup and act like a good students. Sitting on the front table (just right in front of the stage) lol. Very kiasu because I wanna see clearly how's the demo and everything. So as usual, I'm so lazy to remove the makeup during the workshop so I choose not to apply any makeup before this lol. We all were fully prepare before the workshop and here's some behind the scene photo taken by Smelly before he leave the workshop lol. Then I realise there are lots of toner , moisturiser and serum that targeted for diff kind of skin and needs. 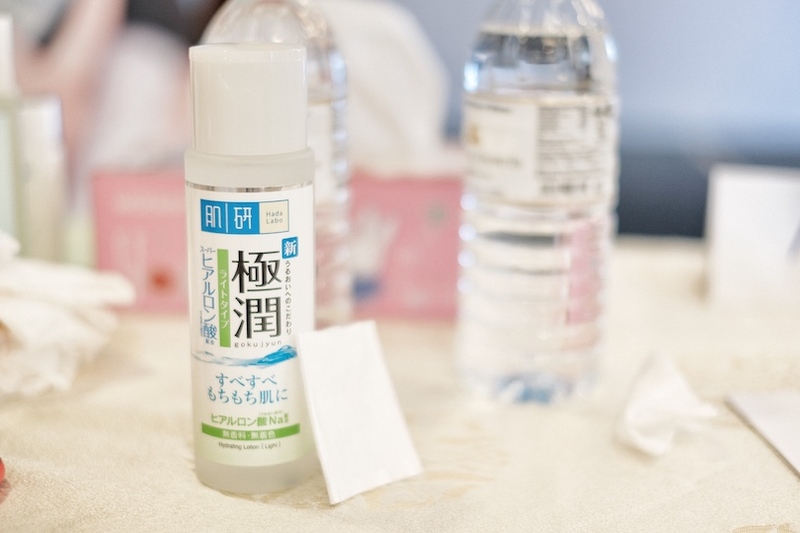 I'm here with a full range of their hot seller product, which is the Hada Labo toner. Discussing and trying their full range toner & I'm sharing some of my beauty / skincare tips with my blogger friends too. So yea, finally Liu Yan is here! I'm so excited and now everyone is busy removing their makeup & foundation. Are you guys ready?? During the workshop we actually sit accordingly our skin type. I'm combination and slightly sensitive skin and here's the product that placed on my table. It's the product that suitable for my skin. So before you start using or trying a new product, remember to look for your correct skin type too. So here's my very first naked face in year 2018 lol. Okay la I mean this is really close because I'm using my portrait lens to shoot for this product and I'm all ready for the workshop. Liu Yan with her model of the day! 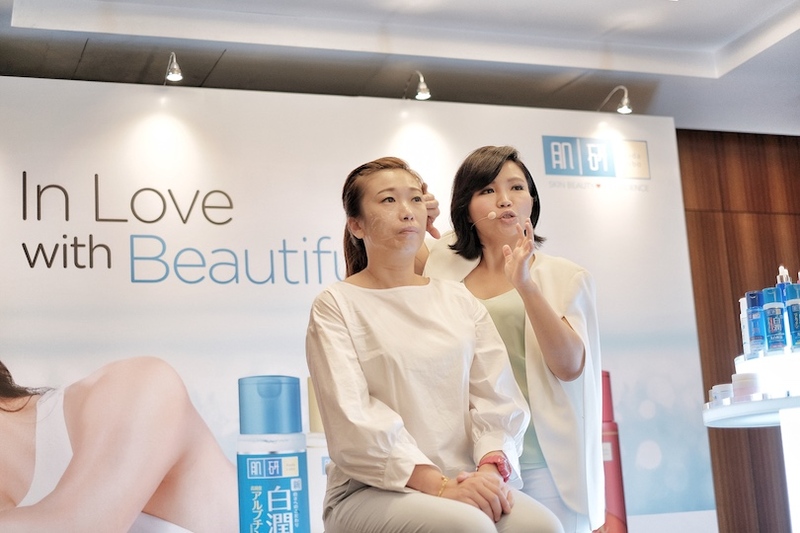 Liu Yan told us that before we start learning any beauty tips, it's important to have a clear and healthy skin. So the first step will be using this Mild Peeling Lotion. I never try this product before and this is actually an exfoliating product. It's so mild and it's exactly like a concentrated toner lol. Liquid based and normally I will use the exfoliating face scrub but this time I feel so surprise Hada Labo actually came out with this mild peeling lotion which helps to polish away dullness and brighten + even out our skin tone. So it's very easy to use. Not straight away pour and use on our face. We need to use it with a help of our cotton pad. Just pour 6-7 drops onto the cotton pad and you can start applying gently onto your skin. From inward to outer corner of your skin. If you are having sensitive skin, like those once you apply any exfoliating or peeling product, your skin start to appear or turn slightly red, then after you pour it onto the cotton pad, remember to use the slightly [PRESS METHOD] instead of a circular motion or keep wipe it on your skin. Skincare Tips #1: So if you are having sensitive skin, just use to cotton pad to gently & slightly press it, just let the product slightly absorb into your skin. Don't be so rude or repeating rubbing back and forward, it creates friction and our skin hurts. Skincare Tips #2 : The second tips is pretty awesome. I never thought of doing this because this is the area where we always ignore lol. Use this peeling lotion on the area behind our ears. That is a very dirty area because we normally forgot to take care of it, didn't really wash it every day lol. So remember to use this mild peeling lotion to remove all the dirt and dead skin cells. 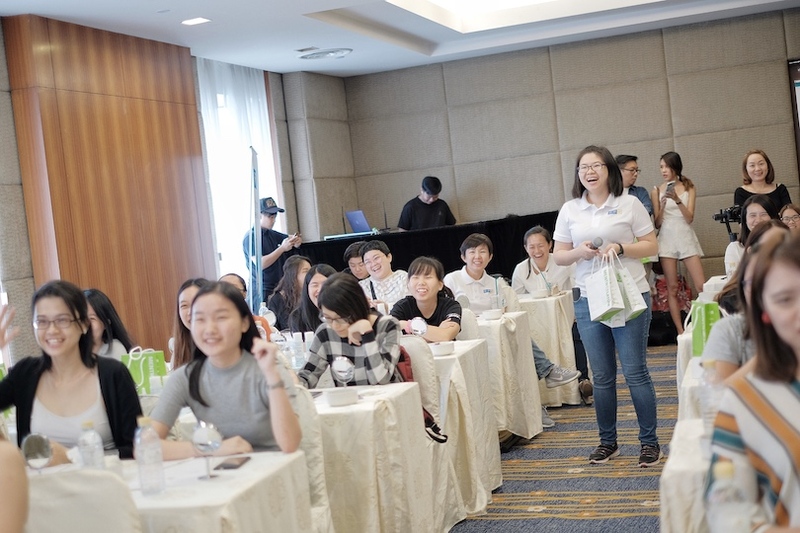 So the whole workshop was conducted in Mandarin. I tried my best to translate all these skincare tips slogan into an English slogan lol. It might be a little bit weird but I think it's the best way to explain for you guys. Next, is time to apply toner after clean your face. 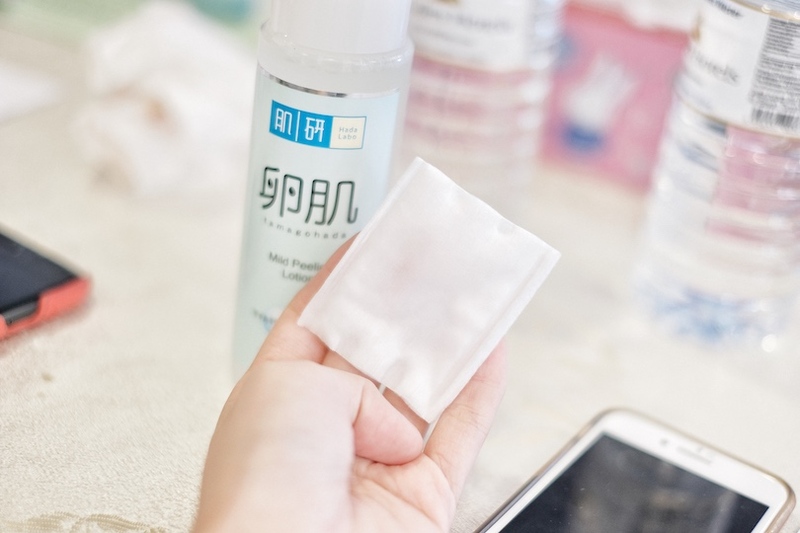 (1)擦 Wipe: This is the best way to apply toner. Whether it's a light texture toner or a concentrated toner. You can use this method. 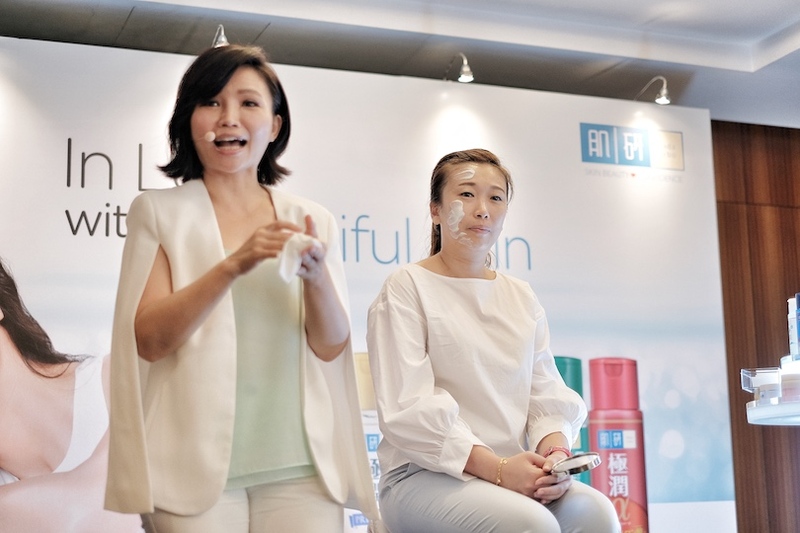 When Liu Yan ask us to demo how we apply our toner, there is some of us who actually apply like rubbing (really hard) on our skin. It's incorrect so in order to do it right, we need gently apply the toner on our skin from inner to outer. Not Z method or rubber back and forward for many times, just wipe from inner to outer corner of our skin. (2)拍 Pat: For pat method. Here's the tips! Pat and apply the toner (with cotton) like drawing a tick on your skin. Tick Tick Tick in a gentle way and you can feel your skin elasticity. I love to do it from the bottom to the top of my skin so my skin can get less sagging by using this method. (3)敷 Put On: Last step for applying toner! If you don't wanna waste any of your toner then here's the tips (which you might already know). Usually it's recommend to put on (like a mask) leave it for 30 second on an oily or super dry area. For example, your cheeks area, under eyes area. I saw some of you guys apply toner in a circular motion, actually it's a method for exfoliating or peeling away your dead skin. So if your skin is really sensitive, don't apply it in a circular motion. Just gently wipe > pat and lastly, put on for another 30 seconds. Skincare Tips #4 : If you are using anti-aging toner, which is slightly rich in term of its ingredients, then you can apply it and do a little massage for lifting purpose. It's really good for helping the toner to absorb into our skin. Now here's another tips on applying any serum or essence product! Just as simple as drawing a heart shape on your face. HAHAHA So easy to remember this! Most of the time I just apply and simply wipe on my skin lol. 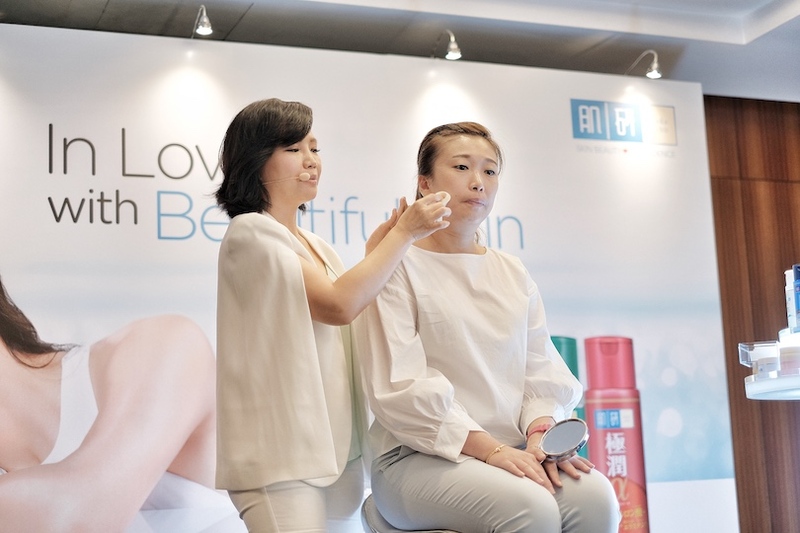 But with this heart shape method, it can help you to lift up your skin. A little lifting magic by using this method. Now I'm using this essence to apply the heart shape method! This essence is really light and hydrating! 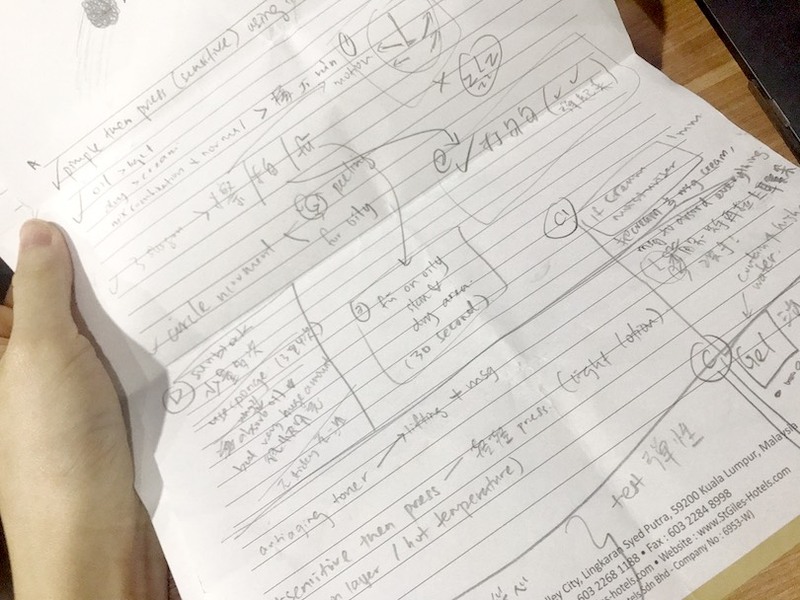 I'm so sorry but have to draw the heart shape to show you guys the exactly method shared by Liu Yan. So here's a really good photo lol, from the middle of your skin, draw a small heart shape, slowly increase the size to the outer of the corner. If you apply it yourself then do it with both hands ya! By using this method, you can feel that your skin become more elastic after using the essence. And you can continue with the next step > Moisturiser! Next skincare tips is quite useful for me. If you are travelling or few hours on flight, you can feel that your face is so puffy so in order to reduce the puffiness, you can use this method to eliminate the excess water from our skin. It's super duper easy, recommend to use with any gel type moisturiser. The reason why we need to use a gel type moisturiser is because it actually contain highest water than a cream type moisturiser. 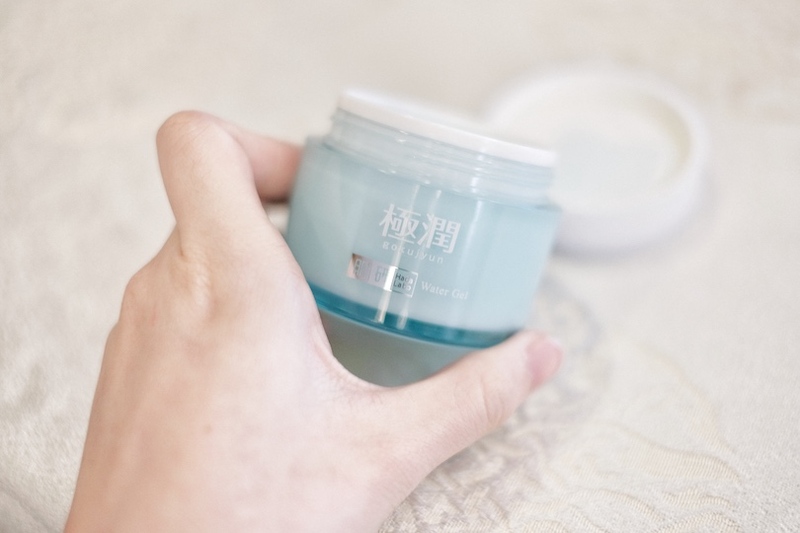 The weight of the water gel actually provide a little weight on our skin, which can successfully eliminate the excess water and reduce puffiness. So in this method, just need to apply a 20 sen size of gel type moisturiser on your skin. About 3mm thickness! Not too thin on this and put it on / wait for 3 mins. So I just apply this on my skin too! So after waited for 3 mins, just simply massage it gently into our skin. If you apply too thick you can wipe the excess one away. But for me it's quite a waste so I normally massage and apply the excess one on my neck area and continue to give it a little massage until I can feel there is no more gel on my skin. Besides, when you do a little massage remember to massage it upward toward your outer corner & until the end of your eyes area. If you have serious puffiness, please take some time to massage on your neck area. This will help you more on eliminating the excess water! For more lifting + massage method, remember to massage it upward by using both hands and slowly pull it upward until the outer corner of your eyes area. How if you are using a cream type moisturiser? 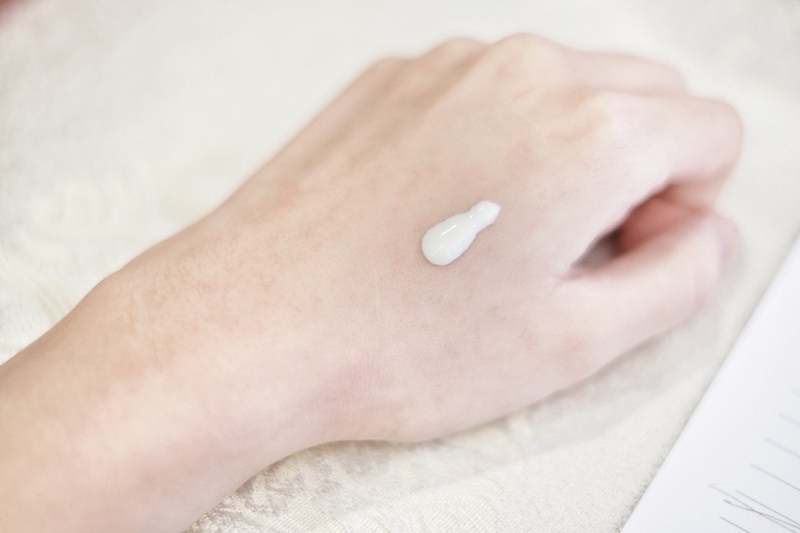 For cream type moisturiser, you need to apply 1mm thickness , a very thin layer onto your face. Then just apply & massage it until it's fully absorb into your skin. Using the same massage method can help you to lift up your sagging skin lol. So always remember to massage it upward! So this is the last skincare tips and this method impressed me the most lol. 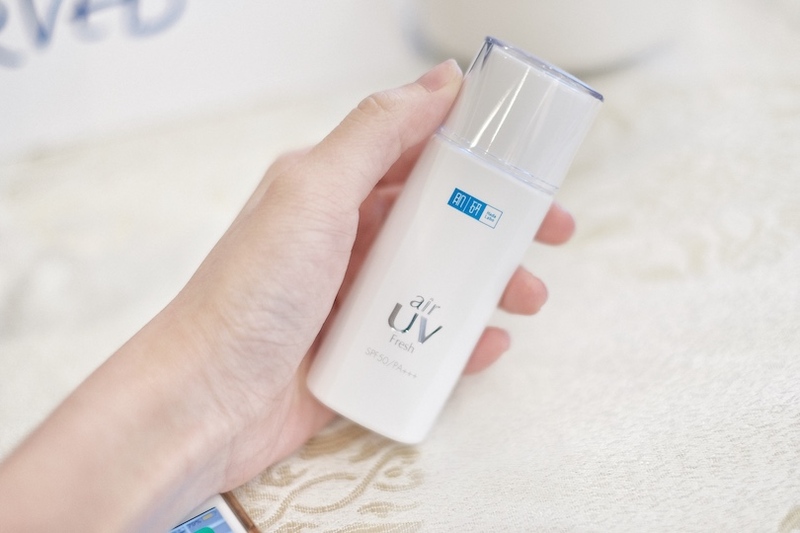 I never thought of this but Liu Yan just prove me this is the best way to apply a sunblock product. So normally when we apply sunblock, we normally apply with our fingers. Am I right? But Liu Yan ask us to try using it with a sponge! YES! A SPONGE! I'm not even joking!! This is too little for a whole face. The correct amount will need to have a 50 sen size lol! I normally apply like 2x 10 sen size wtf! This is the correct amount for half of our face. 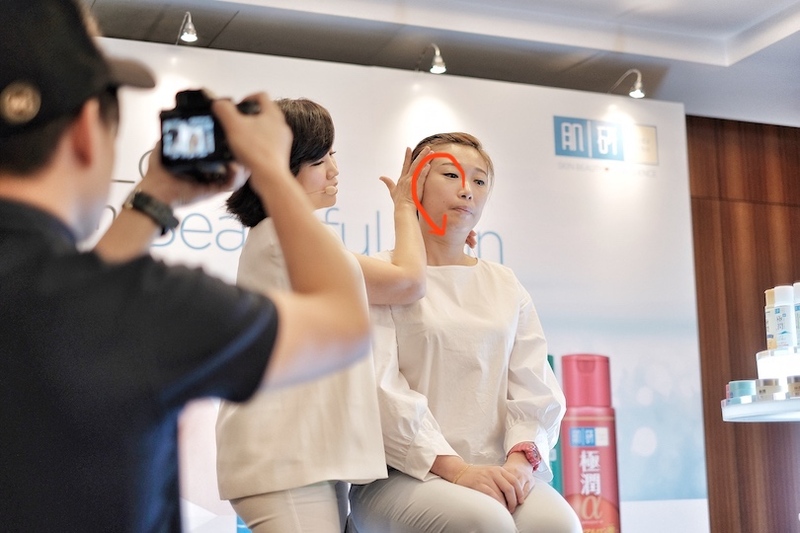 When Liu Yan apply it on the model's face, I was like wtf?! So many?!! But if you using a sponge to apply the sunscreen, you can feel the magic! The sponge makes the sunscreen less greasy / sticky, absorb excess sunscreen and even the amount of product might be really scary but after using the sponge, you can really feel the diff. The sunscreen is more light-weight on your skin. Why? Because the sponge actually helps you to absorb the excess oil! There is only one drawback by using this sponge method! Which is your sunscreen product gonna used up in a short period and you have to get a new one again lol. You can layering your sunscreen by applying few times and you won't feel like you are wearing sunscreen on your face. Apply little by little using the sponge and apply it 3-4 times / layers. 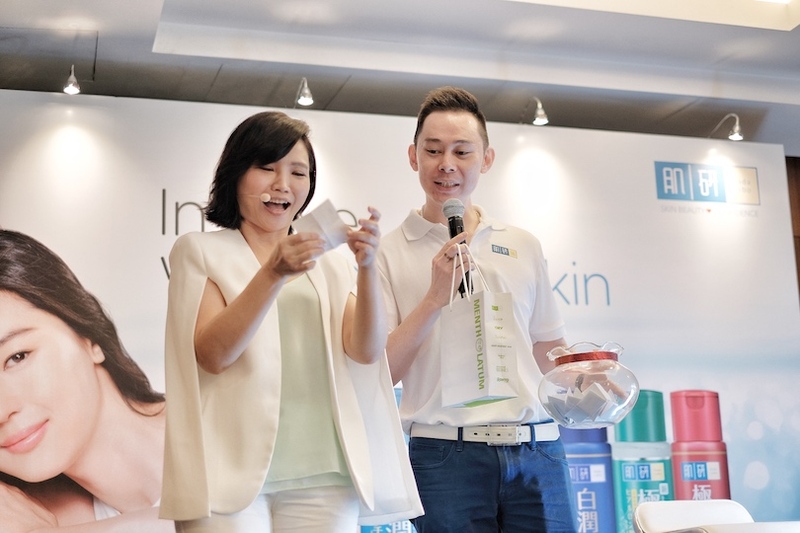 Lastly during the workshop, there is a lucky draw session! Look how excited Liu Yan when it comes to announcing all the winner's name. 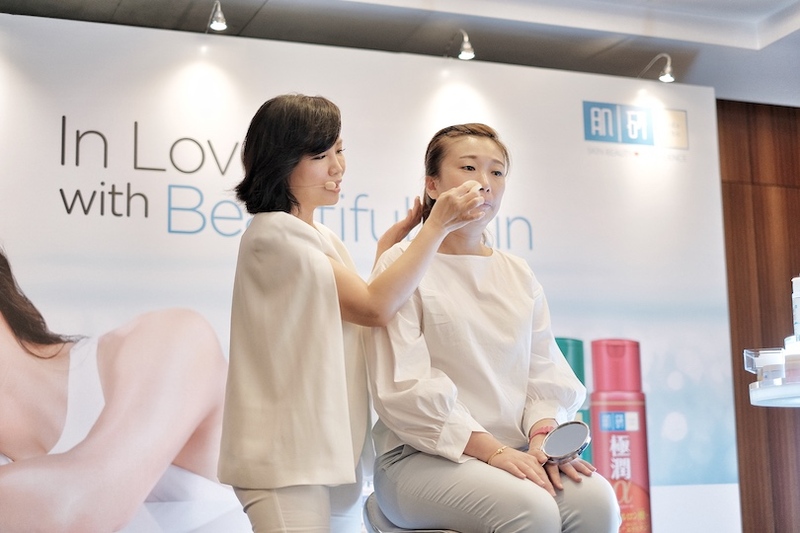 I guess it's come to the end of Hada Labo x Liu Yan Hand-on Beauty Workshop skincare tips and sharing post. 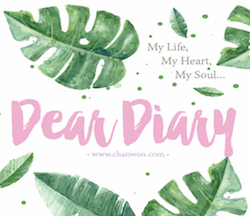 I hope you guys can learn some new beauty tips / hacks from my blog post so that it worth for my time to write down every single thing & share it on my blog for you guys! Luckily I can understand my own writing and doodling lol. Here's a little note that I wrote down during the workshop. 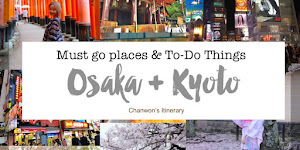 Hope my post can be useful for you! Remember to share these beauty tips for your friends too! That's all for today's sharing. See you on my next post! Love, xoxo.